So wrote Parkinson back in 1656. Chamomile is one of the oldest favorites among garden herbs. 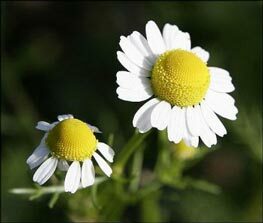 The Egyptians dedicated chamomile to the sun and worshiped it above all other herbs for its healing properties. No plant was better known to the country folk of old. It has been grown for centuries in English gardens for its use as a common domestic medicine. In the gardening book of 1638, William Lawson wrote of “walks, having seats and banks of Camomile—all this to delight the mind and bring health to the body.” One of the aromatic, strewing herbs of the Middle Ages, chamomile was often purposely planted as green walkways in their gardens. It has been said, “Like a camomile bed—the more it is trodden; the more it will spread.” Once firmly established, a chamomile lawn may be mowed with a lawn-mower with blades set fairly high. For centuries chamomile has been reputed to have gentle healing properties. There is a German Chamomile; there is an English chamomile; there is also a Scotch or a wild chamomile. We’ll be looking at this apple-scented herb, helping you to become more familiar and make it a welcomed addition to your herb garden. 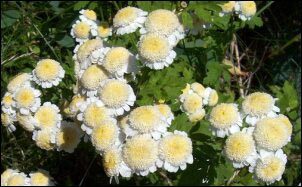 To further confuse you, English or Roman Chamomile, formerly known as Anthemis noblis is now known as Chamaemelum nobile. Anthemis nobilis (renamed Chamaemelum nobile) is a slow-growing perennial, creeping or trailing, never raising its tufts of leaves and flowers up higher than a foot or two. Its root is perennial; the stems, hairy and freely branched, are covered with leaves which are divided into thread-like segments. This gives the whole plant a feathery appearance. In its native habitat of England and other parts of Europe, the blooms appear in the later days of summer and are borne aloft on long erect stalks. Each flower perches on the end of a long stem. The flowers have a yellow center with an outer fringe of white petals—not unlike our familiar daisy but much smaller in size. The whole plant is downy and grayish-green in color. With a distinct fragrance of apples, the fresh plant is strongly scented. The name “chamomile” derives from the Greek—kamai (on the ground) and melon (an apple.) The Spaniards call it “Manzanilla” which signified “a little apple” and gave the same name to one of their lightest sherries which is flavored with this plant. The flower-heads of the Chamaemelum nobile are considered the most valuable for distillation of the oil. Chamomile nobilis var. flore-pleno is the double-flowered variety. English or Roman Chamomile is a perennial native to western Europe, northward to Northern Ireland. Roman Chamomile likes full sun and a slightly acid-to-neutral soil with good drainage. It can be started from seeds, cuttings or by root division. My patch has remained green throughout our mild winter but it does not tolerate our hot, dry summers. An interesting note for companion planting gardeners: camomile (either spelling is correct) is considered the plant’s physician. Do you have a droopy, sickly-looking plant in the garden. Place a chamomile by it and chances are good it will recover. German Chamomile (Matricaria recutita) is an annual native of Europe and western Asia. An adaptable plant, it likes full sun and will tolerate almost any type of growing conditions. A light, sandy, somewhat-moist loam will produce optimum growth. It appreciates lots of water during its growing season. Growing from one to two feet high, its stem is smooth and shiny and finely divided leaf segments cover its numerous branches. By the time it reaches blooming season, which is usually late spring, the plant looks a bit sprawly. Harvesting the flowers and lightly cutting back the plant will produce a second crop before the plant dies. Less fragrant than A. Nobilis, German Chamomile flowers are slightly bitter tasting. There are several other plants that are covered by the “Chamomile” umbrella. The Scotch Chamomile of commerce is sometimes known as the Wild Chamomile. It has a strong aromatic odor and a very bitter taste. It flourishes in rather dry, sandy soil that resembles the wild, open land of its natural habitat. It is considered the most powerful of all the chamomiles in curative properties. The powerful alkali contained in its single flowers is liable to destroy the coating of the stomach and bowels. Another wild member of this family, the Corn Chamomile (Anthemis arvensis), does not posses the little chaffy scales between its florets. Although it resembles Roman Chamomile, it is scentless. Another imitator is the Anthemis cotula, commonly known as stinking mayweed or dog-fennel. As its name implies, it can be distinguished by its disagreeable scent. It also has a reputation of blistering the hand that touches it, although it does share the medicinal properties of other chamomiles. Dyer’s chamomile (Anthemis tinctoria) yields a yellow-brown dye from its golden flowers and grows to two and a half feet. Stinking Chamomile (Anthemis cotula), also known as Mayweed or Dog-Fennel, is an annual commonly found in waste places and resembles the true Chamomile. It is distinguished from the other Chamomiles by its fetid odor which Gerard calls “a naughty smell.” The whole plant has this intense odor; if penetrated, an acrid juice will often blister the hand which gathers it. Like true Chamomile, a strong decoction of this herb will produce vomiting and sweating. The infusion made from one ounce in a pint of boiling water and taken warm in wine-glassful doses has been successful in easing sick headaches and fevers. Most seed purchased as chamomile are usually M. Recutita. Tea-bagged chamomile often contains seeds. Tear open a package, plant the contents and see what happens. The annual German Chamomile can be seeded in either the fall or spring. Once established, it will reseed itself if flower heads remain unharvested. Seed may be sown thinly in May where they will permanently grow. Old plants may be divided into sets in March and replanted in well-manured soil in rows two and a half feet apart with eighteen inches between plants. Tread the small plants in firmly. Keep them clean during the summer by hand-weeding, as hoeing is apt to destroy such little plants. D. N. Treanague, a cultivar of German chamomile is non-flowering, mat-forming clone with apple-scented leaves. Grows to two inches high and make a fragrant lawn. Roman Chamomile, (Anthemis nobilis renamed Chamaemelum nobile,) is a slow-growing plant, creeping or trailing its tufts of leaves and flowers only a foot in height. Its root is perennial; the stems, hairy and freely branched, are covered with leaves which are divided into thread-like segments. This gives the whole plant a feathery appearance. The seed of Roman chamomile is very fine and requires a well-prepared soil. Sow seed shallowly; simply scatter seed on the soil’s surface and tamp down gently with the flat side of a hoe. The young seedlings can withstand a mild frost. Both Roman and German chamomile like lots of sun. Creeping rootstock spreads the plants, creating desirable carpeting surface. When walked on, its strong, fragrant scent will often reveal its presence before it is seen. Mrs. M. Grieve suggested walking over the plant seems beneficial to it. The aromatic fragrance gives no hint of its bitterness of taste. All the Chamomiles have a tiny chaffy scale between each two florets and are downy and grayish-green in color. 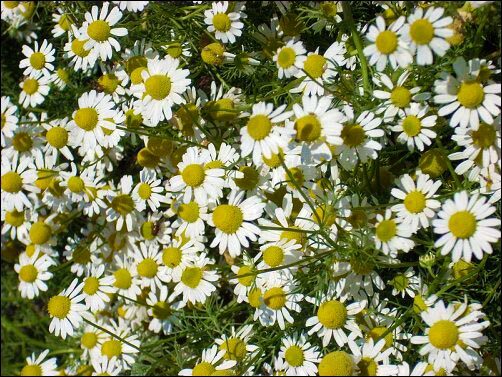 The wild type flourishes in a rather dry, sandy soil but the double-flowered Chamomile needs a richer soil and gives the heaviest crop of blooms in moist, stiff-ish black loam. Harvest the flowers for drying when the petals begin to turn back on the disk. The part of the plant chiefly used medicinally is the flower-heads. Both single and double flowers are used in medicine but the single, wild Chamomile appear to be more powerful. The English Chamomile is the double form. English flower-heads are considered the most valuable for distillation of the oil. A simple way to make chamomile oil, according to the Egyptians, is to take fresh flowers (one ounce) and beat them up with pure olive oil. Steep the flowers in the oil for twenty-four hours or more, then strain. Extracts of the plant or the oil itself have three primary uses: as anti-inflammatories for various afflictions of the skin and mucous membranes; as antispasmodics for treating ailments like indigestion and menstrual cramps; and as anti-infective for numerous minor illnesses. In Europe, the medicinal properties of chamomile is highly esteemed. All medicinal recommendations are backed by not only many centuries of common usage but by intensive research. Adverse effects are minimal; only someone who has an allergic reaction to members of the aster family may develop problems. People who have known sensitivities to pollen should be cautious about drinking the tea. An infusion, made with one ounce of the flowers to one pint of boiling water, is an old-fashioned but wonderfully, soothing sedative. An infusion given in teaspoonful doses acts as a nerve sedative. Prepare the tea in a covered container to capture the steam. Bring the water to a boil beforehand as boiling will dissipate the oil. The infusion should be allowed to stand at least ten minutes before straining. Adding infusions of chamomile make soothing baths, just be sure to use large amounts of the herb as its oils are difficult to distill and dissipate quickly. Chamomile may reduce skin puffiness and acts as a gentle astringent. A chamomile-flower facial is frequently used by a well-known skin-care specialist. For years, women have used chamomile tea as a hair rinse to accentuate natural blond highlights. Chamomile is still used to bring golden highlights to brown hair; combined with neutral henna, it adds highlights to very dark hair. Combined with ginger and alkalis, a cold infusion is effective in relieving ordinary indigestion. It has sometimes been used to ease intermittent fevers. The tea is also taken to relieve spasms and inflammatory conditions of the gastrointestinal tract. Chamomile flowers are recommended as a tonic for their diuretic and tonic properties. Chamomile also contains powerful antiseptic properties. The whole herb is used to made a lotion for treating toothaches, earaches, neuralgia, etc. Used externally as a poultice, the flowers are helpful in reducing swellings. Chamomile is used in bath herbs and face lotions to firm the tissues, keep the skin young looking, brighten the eyes and relieve weariness. If drunk before bed, it will help you fall asleep. The relaxing aroma was also inhaled as snuff or smoked to relieve asthma and cure insomnia. Jeanne Rose says it is excellent for dissolving kidney stones. And alcoholics will find it helpful for DTs. 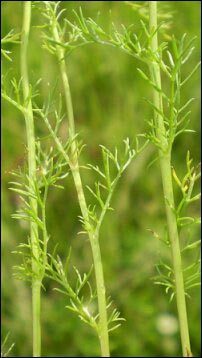 Both chamomiles have been used as folk cancer treatments. In the days before refrigeration, immersing meat in chamomile tea was supposed to help eliminate the rancid odor of spoilage. Chamomile was also reputed to make an excellent insect repellant. German chamomile gives a delicate shade of yellow when used as a dye. In floral symbolism, Chamomile represents “may all your wishes come true,” according to Kate Greenaway’s book. It also represents humility. Its apple fragrance makes it a wonderful addition to potpourris and aromatic dried flower arrangements. With its easy-to-care-for garden routines, chamomiles make lovely additions to any landscape. Roman chamomile: Full sun and a slightly acid-to-neutral soil with good drainage. Does not tolerate hot, dry weather; an excellent, but slow-growing, ground cover for cooler areas. Chamomile represents humility in flower language. Chamomile is used to flavor a very fine sherry in Spain. To bring golden highlights to brown hair, rinse with a chamomile tea. Most seed purchased as chamomile is usuallyMatricaria recutita, sometimes called Wild Chamomile. Walking on a chamomile lawn is a pleasant experience and will not harm the plants. Chamomile’s aromatic fragrance gives no hint of its bitterness of taste.